By the records, the Reds and the Braves have been on eerily similar paths. Playoff teams that saw their window of opportunity fade and began the long, small-market process of rebuilding through the draft, selling assets, and tastefully tanking for years. What I am trying to get at is the Reds and the Braves were nearly identical teams starting their rebuilds, so why are the Reds still bottom three in the MLB and the Braves on top of the NL East once again? In my opinion, the best way for a small-market team to rebuild is through the draft. That’s not a controversial opinion by any means, but I think it bears to be repeated that I wholly disagree with the Reds “best player available” strategy. What I’m looking at here is how the 2015-2017 drafts have currently shaped both the Braves and Reds 40-man rosters and top 30 prospects according to MLB Pipeline. For both teams, 15 of their top 30 prospects have come via draft, with all four of the Reds top prospects being drafted in the past three years. Six of the Braves top 10 prospects were drafted in house and 12 of the top 20 were. For the Reds, 10 of their top 20 were in-house draft picks. Currently, two Braves draft picks from the last three years are on the 40-man (Mike Soroka and A.J. Minter) while the Reds only have one (Tanner Rainey). That’s a lot of contextless numbers, so here’s the takeaway of how the two teams have drafted between 2015 and 2017: Basically the same. More of the Braves draftees are at AA or higher, whereas the Reds have taken more high upside guys still in A or A+ but that’s about it and even that difference is slim. So if the two teams are rebuilding as effectively as they can through the draft, how did the Braves come by their surplus of young talent? At the end of 2014, the Reds tradable assets included Johnny Cueto, Aroldis Chapman, Jay Bruce, Todd Frazier, Mat Latos, Mike Leake, and Alfredo Simon. All were eventually moved in the subsequent three seasons. For those seven players, the Reds received 18 prospects in return, of which eight are on the current 40-man roster and a ninth, Rookie Davis, appears on the Reds Top 30 prospects. If we include the returns of the 2016 Dan Straily trade, then ten players are on the current 40-man roster Ã¢â‚¬â€ the additions being Luis Castillo and Austin Brice. When evaluating those ten players on the 40-man, the Reds have an injured starter (Anthony DeSclafani), two underperforming starters (Brandon Finnegan, Castillo), a shortstop coming into his own (Jose Peraza), a superstar third baseman (Eugenio Suarez), an underrated outfielder (Scott Schebler), an overrated outfielder (Adam Duvall), a bullpen arm (Austin Brice) and two prospect pitchers who may never meet expectations (Cody Reed, Keury Mella). All in all, watching these trades has been frustrating at times, but the Reds really haven’t done poorly. The Braves meanwhile have committed highway robbery approximately a million times over. With tradable assets Jason Heyward, Aaron Harang, Evan Gattis, Craig Kimbrel, Andrelton Simmons, Phil Gosselin (lol), Justin Upton, Melvin Upton, Ervin Santana and Alex Wood, all of whom they moved except Harang and Santana who were let go in free agency. The difference in how the Reds and Braves approached trading assets amounts to the difference between checkers and chess. Where the Reds moved guys for prospects they wanted to hold, the Braves moved guys for other guys who they would then move again later. Following the paper trail of how they acquired their prospects borders on insanity. For example, Jason Heyward was traded to the Cardinals for Tyrell Jenkins and Shelby Miller. Jenkins was later traded to the Rangers in an utterly inconsequential move, but Miller was traded to the Dbacks for Aaron Blair, Ender Inciarte, and Dansby Swanson Ã¢â‚¬â€ or as they are otherwise known, starting right fielder, starting shortstop, and Aaron Blair. Another example: Justin Upton was traded to San Diego for four guys including Max Fried and Mallex Smith. Later on, Smith was traded to the Mariners with Shae Simmons for Luiz Gohara and another prospect. That’s two of the Braves top seven prospects for half a year of Upton in San Diego and two flights across the country for Smith. In more straightforward moves, Evan Gattis turned into Mike Foltynewicz and Phil Gosselin into Touki Toussaint. Let that sink in. Phil Gosselin was worth Touki Toussaint, the Braves No. 11 prospect, once upon a time. While the Reds have built a solid deck of young prospects through their moves, the Braves managed some trading voodoo to wind up with five top pitching prospects and two of their current starting nine. The more I look at these deals, it might be another wash between the Braves and Reds, but it very much feels like the Braves won the battle of salvaging value from older guys. So this may be a bit unfair given that the Braves forfeited the top prospect, Kevin Maitan, associated with the international tampering scandal. However, when you remember that the Braves two best young players, Ronald Acuna Jr. and Ozzie Albies, are both international players, it doesn’t look good for the Braves rebuild being on the up and up. While Acuna and Albies were both signed before disgraced former General Manager John Coppolella took over, other young international prospects like Critian Pache (No. 9), William Contreas (No. 18), and Derian Cruz (No. 20) were. Probably unfair to speculate on my part that the Braves rebuild has outdone the Reds on the basis of tampering alone Ã¢â‚¬â€ the Reds do have a similar number of international prospects supposedly signed above table after all. At the end of the day, it might just be luck. The Braves took chances on really young guys and then pushed them through the minors aggressively. The Reds have taken fewer chances on younger guys and have not nearly been as aggressive with development. That could be a system wide issue on the Reds part or it could be false correlation on mine. Whatever the case, the Braves look to have rebuilt and are ready to compete in the NL East for the next few years to come. The Reds…well 2020 could be our year. It’s been an abysmal start to the year for the Kangaroo Court Fees, but Mike Soroka (Braves No. 3 prospect) has been called up, meaning my time to shine is near. With Soroka, Franklin Barreto, Nick Senzel, Austin Meadows, Austin Voth, and Jake Bauers all nearing the Majors, my fantasy fortunes finally may come to fruition. But for now, it’s 0-4 to start the season and the second fewest points scored. 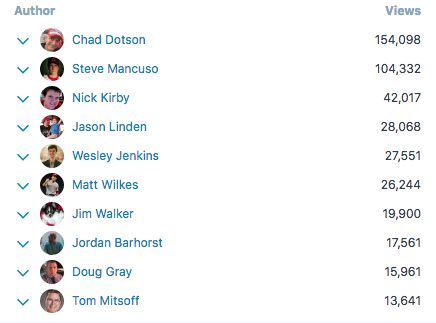 In better news, I have surpassed Matt Wilkes for fifth in the post views standings, meaning there is a strong youth movement near the top of the leaderboard. Jason Linden is also within striking distance and Nick Kirby isn’t too, too far ahead. Top three will be mine this year, I can feel it. Sorry, but it is the regular season. DW cannot make a trade all of our young guys are HOF candidates at this time. We must not trade. DW will wet his pants if he has too. +1000 . Couldn’t have said it better. The oldest continuous ML franchise (Braves) seem to be outdistancing the oldest ML franchise (Reds) in the rebuild race. I don’t understand the “continuous.” I wasn’t aware that the Reds had ever gone on sabbatical, though a case could be made that they’re doing so this year. Braves two steps ahead on the trade market. Just have to look at the players left from ’14 to understand that. If that doesnt get through, “Trading Aging Assets” will like a wrecking ball. The difference is that the Braves sign and develop hitters from Latin America and the Caribbean. The Reds do not. When a team goes 0-for-50 years in a hitter-rich area, what should we expect? It is the equivalent of not signing hitters from California. With Jose Siri and Andy Sugilio, they at least now have some prospects (both on the disabled list), although they may or may not work out. at least a generation, then they wouldn’t be where they are now. The only real “success”, such that it is, has been Chapman and Iglesias, and really the only reason they got either one is because every other organization saw them both as relievers, the Reds paid starter money….and still ended up with them both in the bullpen. Their biggest international signing was Alfredo freaking Rodriguez who could literally not hit his way out of a paper bag. Before he got hurt he was hitting .192/.276/.192 as a 24 year old in AA. For his Reds career (638 PA) his OBP (.299) is higher than his SLG (.290). Talk about flushing money down the toilet. Yes… From just about everything I’d read and have read since, I absolutely HATE that signing. I don’t understand it at all. Didn’t understand it at the time and don’t now. The biggest differences in how the two teams went about the rebuild, is that the Braves actually went all in and understood what needed to be done, whereas the Reds thought they could cheat it. The Reds targeted guys in AA or higher, the Braves targeted players with higher ceilings lower in the minor leagues. Look at the Upton deal as a perfect example. They received 4 players; 3 of the players were in A or A+ when the Braves got them; that is a very forward thinking organization. Get players that will, potentially help you in 3-4 years. Look at the Shelby Miller trade; Miller was 24. TWENTY-FOUR, when the Braves traded him, coming off a season where he pitched 200+ innings with a 3.45 FIP. Imagine what the Reds might have received had they traded Disclafani after the 2016 season when he was 26, seemingly healthy, and coming off of back to back sub 4.00 FIP seasons? No one could have predicted that Miller and Desclafani would have the last two years they’ve had. But as the saying goes, sometimes fortune favors the bold. The entire point of a rebuild is to increase your asset total. The Reds got Disclafani for Mat Latos. That’s a 1 for 1 deal. Granted it worked really well for a couple of years, but the fact remains when you are rebuilding if you trade one good player for another good player you’re back at square one. The 2014 Reds were a 74 win team, they swapped 27 year old Latos for 25 year old Desclafini. You’re not getting THAT younger and you aren’t improving the team. The Reds were so concerned with patting themselves on the back for winning THAT trade, that they were unable to win it again by turning Desclafani into MULTIPLE assets. 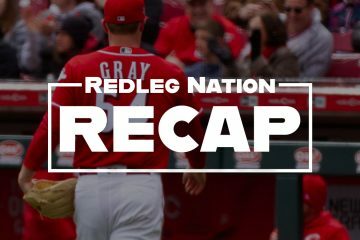 The Reds rebuild is simply a failure. I also agree with Wesley’s take that the Reds don’t move their best prospects aggressively enough, opting for a one size fits all development path. Senzel/Long/Winker (last year)/you could even say Trammell and Tyler Stephenson………the light is already on for these dudes…….what they need more than anything is exposure to the best competition available at the highest level. Yeah, Shed Long is a real head-scratcher. In 2015 he destroys A ball pitching (144 wRC+ in almost 200 PA) so in 2016 they..have him get another 389 PA (146 wRC+). He bumps all the way up to…A+ where he does even better (153 wRC+ in 150 PA). So in 2017 they…start him in A+ again where he improves AGAIN (167 wRC+ in 279 PA). They finally get him to AA where he gets injured and still produces at league average (100 wRC+) at age 21, but then they send him back to AA again where he is, naturally, killing it (158 wRC+). They can’t call him up to AAA because Senzel is playing 2nd base and they can’t call Senzel up to MLB because they’re cheap. Of course, they did just add ANOTHER 2B prospect (Herrera) to AAA last night, so they’re still stuck with no where to play arguably their 2nd best prospect. It’s just a dumpster fire at every level of this organization with no clear plan at all. 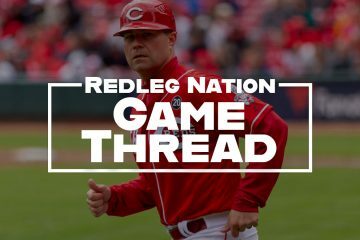 I agree, generally, but what do you think Reds fans- including here at RLN–would think about trading young, established MLB playrs for prospects in the lower minors? Lynchings might ensue. We don’t have much patience. And at some point,they would need to hang on to enough MLB players to make a run. If the Reds had traded Desclafani after the 2016 season, and if they had traded Suarez for example after last season, how much of an impact would that have had on this 7-24 start? Almost zero right? I mean, the Reds have lost 90+ games 3 straight years, have 4 straight losing seasons, and if we’re being honest, would take a miracle to avoid losing 100 games this season. What they did didn’t work, and most frustrating to me, it was obvious it wouldn’t and wasn’t working while they were doing it. I fully understand that I am probably in a small minority that would have had the patience to deal with an actual rebuild, where going into 2015 we had a pretty good idea we wouldn’t compete again for 3-4 years. A 2015 team that begins/ends play without Todd Frazier, Jay Bruce, Brandon Phillips, Mike Leake ,Johnny Cueto, and Arolids Chapman would have been really hard to stomach for a lot of Reds fans; I completely understand that. But if they had swallowed their medicine back then, they would be reaping the rewards now, and all of those fans angry then would have been back now. As it is, the people who couldn’t stomach a rebuild are still really angry. I mean, the team has lost 90 games 3 straight years. But now, the organization is also losing people like myself and, I’d imagine, some of the others around here that understood the need for the rebuild and were ready to go through the dark times that would inevitably come. You can use whatever metaphor you want, ripping off a band-aid, breaking up with someone instead of leading them on, shooting tequila instead of sipping it. Whatever. These metaphors work precisely because they are accurate. Any time you need to do something unpleasant, the longer you drag it out in an attempt to decrease present pain, the longer you end up with more severe long term pain. You’re probably right (I still wouldn’t trade Suarez for any likely offer), but I do sip tequila when I drink it. Best way to savor it. Only if it’s good tequila! Otherwise, be like Russell Westbrook – pass or shoot. Yes, only when it’s good tequila. Right, but I am thinking that they were looking at 2018 as a competitive year with 2019 being a possible playoff season. They Didn’t know they were going to start this year 8-28. They were rebuilding for this year not for 2021. I fully agree with your last 3 paragraphs, though at the time, I was ok with the Reds “going for it” one more year. Reds Rebuild did NOT start in 2014. Started in 2015 offseason, really. This is a great analysis, which points out that the Reds have likely failed in this rebuild. The difficulty is that there were many blueprints out there on how to do a rebuild. The problem with the Reds organization is that they overvalue their existing players on the MLB roster. Which has produced 4 straight 90 loss seasons. The Braves have 3 starters under 22 and as noted above, the Reds are afraid to promote Long above AA and are leaving Senzel at AAA. The obvious item that shows the Reds organization is the story about afraid to give on Hamilton because he might become good. That thinking and the “hope they are not injured” plan for the Starting Pitching is a good indication of where the Reds are today. Interesting, nuanced, well written post, Wes. As someone said the Reds are cheap. They don’t want to call up anyone before the age 24. If they draft the best player available there must be something wrong with their development system. I have seen better defense in Little league than the Reds have displayed this year. For me, the Reds failed because they targeted “major league ready” talent instead of going for the best talent available to try to shorten the rebuild. That’s how they ended up with 4 dudes in AA and above for Chapman instead of someone like Torres. They ended up with a bunch of AAAA players with limited upside. Suarez so far has been the major exception to that rule. And as has been pointed out, they have refused to invest in the international market, which right now, is the best efficiency going for small-market teams. AlfRod was a waste when they signed him. I’m hoping Jose Garcia works out better. Robert Stephenson a 1st round draft pick under WJ has pitched 772 professional innings (farm system + Cincinnati). I read years ago that as a rule of thumb it takes 1,000 professional innings for a pitcher to hone his craft. the clock is ticking on Mr. Stephenson. Newcombe, Soroka, Fried in Atl. Gozhara, Allard, Sims, Wisler, Blair in AAA. Kyle Wright, Toussant in AA. The Braves have a plethora of arms because they aren’t afraid to make astute trades and draft well. The Reds have Stephenson in AAA. Santillan at AA and Greene at Low A. But, I bet the Reds lead the league in bobblehead giveaways! I forgot the Reds have Castillo and Mahle in Cincinnati. One acquired in a Williams trade and one drafted 7th by WJ. Oh, Atl also has Ian Anderson (former #1) and Joey Wentz (CBA 2016) at Hi A. Kyle Muller 2016 2nd round at Low A. They are filthy rich in pitching! Bravo! Wes Jenkins on this write-up. Nice research. I am optimistic on offense – assuming Senzel is back playing and effective by Monday. There is a compelling argument to be made that Eugenio Suarez is the Reds best player now – so the rebuild has produced 2 young potential stars in Suarez and Senzel. Winker looks to be a great young hitter and Schebler is already a 30 home run guy who might be a 35-40 guy in GABP. Barnhart is solid and T. Stephenson appears to be back on track. Everyone hits light years better. Trout, Blackmon,Pham ,Benintendi,Conforto, Pollack, McCutcheon, Indians CF. The productivity gap in CF between 30 other clubs and Cincinnati is the biggest gap on the Reds position roster and it’s not close. The fact the Reds won’t address that tells me they aren’t committed to winning in 2019. They are waiting for the Homer contract to go away. My apologies: Amir Garrett, Romano, Finnegan; and, Reed at AAA. Still projects. Peraza spent his first 5 professional seasons with the Braves has an international free agent. He was acquired by the Dodgers in a 3 team trade among Braves, Dodgers and Marlins that involved Bronson Arroyo. Wes mentioned system wide player development. Peraza, perhaps the only Red that knows how to bunt, learned has a Braves’ prospect. Billy knows how to fake bunt! That’s got to be good for something. The biggest difference is the Reds management knee-jerked and signed Bailey and Votto to massive contracts strapping the teams ability to enter the FA market, except for DFA’s and scrubs. The Braves have Freeman and Teheran at 15 mil, They can be a player in the FA market when they feel the team is close. i look for them to nab a quality FA in the near term. The Reds are praying for a miracle. Yes, it’s clear that those 2 contracts are the biggest reasons the Reds rebuild has stunk. Do you really think so? One of those contracts has been for an MVP candidate year in and year out. The other contract hasn’t worked out. The Reds wanted to sign who they thought was their best hitter and the guy that they thought could be their best and most durable pitcher. While these contracts do tie up a good amount of available money, the Reds can still afford to sign free-agents. can you judge a rebuild in the middle of it? Unexpected things happen and will–to the Reds and the Braves. I judge the so called “rebuild” to be in year 5. After reading the 2006 epistle to the Reds faithful from BC and the Williams brothers about how they know how to build a “winning” team I interpret the “so-called” rebuild to be an attempt by present ownership to “re-boot” their 2006 proclamation. 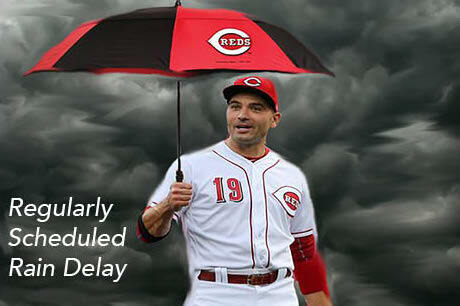 The problem is too many Reds fans let the Castellinis and Williams off the hook for inept leadership. I’ve said it before, if the Reds were an East Coast team the media and fans would not let ownership get away with half the stuff they pull. Nice job and comparison. I think once a player has been in the majors like Stevenson they become complacent and most of the time it shows in their performance, like Stevenson had it going last year at the end of the year, i thought and still do think he would show better in Cincy than he is now in Louisville. As it is now he may not even get back up to Cincy this year. Aside from the over exuberance with Peraza and batting him leadoff, what happened to Winker? Is he hurt? And are they facing a LH pitcher tonight? If so, remove BH from the lineup post-haste! He got on base 3 times. Hindsight is 20/20. I believe that the lineup is being directed by the front office/ownership. Why else would Winker not be in the lineup? The FO clowns are still trying to gin up interest in BH and Duvall trades that they should have made in the offseason. this FO/ownership team is…..
They’re evidently still using the outfield rotation, but Riggleman has indicated that the experiment will end soon. Two pet peeves hit on this article. The Reds glacial promoting practices. Yes, I know you shouldn’t reward mediocrity, but some times you have to just promote a prospect that isn’t exactly tearing it up based on games/ABs at that level. Keeping a player at low or high A for two years is too slow in my opinion. Many times promoting a player can unlock unseen performance or attitude (good kind). Aggressively promote and if after two months at a level a kid is overwhelmed, then get him some lenghty one-on-one teaching and look at video of the at bats or pitches, see if there is a batting stance issue or a arm slot issue or over-striding or something. Secondly, get the players that can hit and show they have good form (age 17, 18, college, whatever). Put a premium on that, especially with international signings. The Reds seem to put TOO much premium on all-field, low-hit players. The Braves put a premium on solid hititng players with upside tools. It’s easier to teach fielding that it is to teach hitting and you don’t need a single gold glover to win a world series…just 8 decent/solid fielders that can actually hit. The Braves also AGGRESSIVELY dealt veterans, and did not piddle around. The Reds kept waiting and waiting well past peak value (Cueto, Frazier, Bruce, Cosart, etc). The Braves ALSO signed several veteran relievers/pitchers EACH pre-season with the sole intent to trade them for more prospects in July. The Reds didn’t want to spend 1 million in order to trade for a prospect later…too cheap or lack of forsight or ignorant to the ease of acquiring prospects, especially by having a couple of 30 year old RP’s that are solid come July. SAD. The Braves also seem to do MUCH better with young pitchers. Seems like more than half their top 5 round drafted pitches are looking very good at higher minors levels, while the Reds have one or two solid SPs in AAA/AA/high A at any given time, the Braves have 5 or 6 with a couple always looking better than our best SP prospect. I am frustrated. Very frustrated. We can draft and draft and trade and trade and barely a handful of prospects have legitimate MLB future, and most of those not high upside (SP4 or 1 WAR fielders). I think the Reds just have been to old, too slow, too cheap at the executive/ownership levels. I am the first to say new technology isn’t everything, but it is clear those franchises that make use of computer analysis of swings or pitch deliveries seem to have much better results. I suspect the Braves have some of that and the Reds don’t. Certainly it is well known the Astros make heavy use of laboraties and computer software to improve small aspects of a hitter or pitchers motions, with great results. I am a Reds fan, but I don’t see any hint of a World Series appearance in the next 6 years, just not enough talent and not enough coaching/training/teaching…relatively speaking. I’m late to the party but great analysis Wes. This is my favorite piece you’ve put out so far. Very well done.